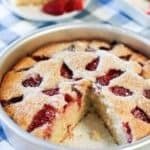 You are here: Home / Cake Recipes / Easy Strawberry Cake! 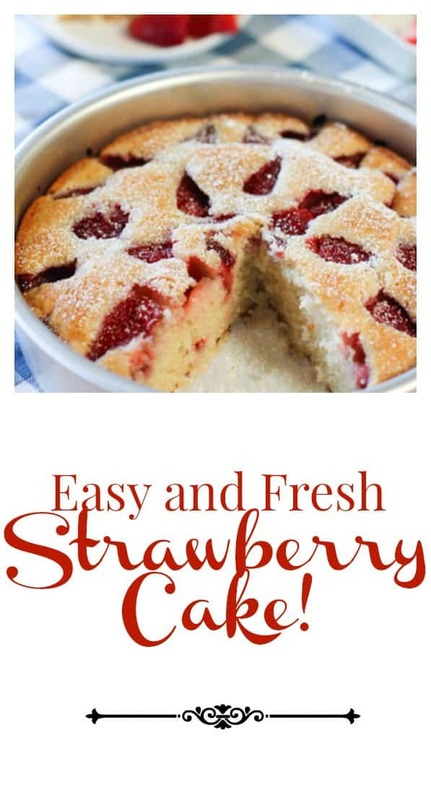 This easy to make snack cake is the perfect size to use up those strawberries that are just on the brink of going bad! Don’t you love when you can take something in your fridge that you were contemplating throwing out, and turn it into something perfectly wonderful? I had these strawberries that were slowing shriveling up in the fridge. These were really good, expensive berries that somehow got pushed to the back …. left there to shrivel up and die a sad lonely berry death. Ugh! I googled and Pinterested (I think that word is in the dictionary now), until I found the perfect use for them. I landed on Marthas Strawberry Cake. Where has this cake been all my life? How easy and beautiful it is! You could substitute the strawberries for most any fruit. I’m looking forward to trying raspberries and peaches. It stayed fresh for days because it is so moist and it uses ingredients that you most likely have hanging around. If you are looking for more uses for your sad little strawbs – try my Strawberry Shortcake Cookies! Preheat oven to 350 degrees. Butter a 10-inch pie plate. Combine flour, baking powder, and salt together into a medium bowl. Bake 40-45 minutes or until cake is golden brown and firm to the touch. Cake can be stored at room temperature, loosely covered, up to 2 days. Thanks for the note Beryl! Hi Sally, yes but you will want to double it. Just hover over where it says ‘servings 6’ and a scale will pop up that you can slide to 12 servings. 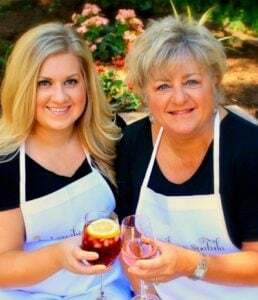 Hi Kathi, So many of your recipes look enticing. This is the first recipe of yours I have tried. Sadly, I was disappointed. Your baking time of 40-45 minutes is way off. After 50 minutes my cake was still underdone in the center. I used a cake pan, as you suggested in your response to one of the questions. Given the timing issues I had, as well as the timing issues mentioned by another reviewer, I checked the original version of the recipe published by Martha Stewart. Your recipe is identical to hers except for the baking time. She recommends 10 minutes at 350 followed by 60 minutes at 325. BIG difference. Hi Ellie, Truly appreciate your note. The baking method worked for me. I didn’t follow Martha’s recipe exactly as I was trying to eliminate the step of having to reduce the oven temp. I think I need to remake this and make sure it’s working for everyone! Thank you again for the note! i just made this cake using blueberries and peaches and it turned out really well. I stirred the blueberries through the batter and arranged the sliced peaches on the top. I would have posted a photo but couldn’t figure out how to do that! The only thing I would say is to check your cake after 40 mins once you have turned it down. My cake was done in about 55 mins total. This one is a keeper! Did u use a pie plate or springform pan? the pics looks like a springform and I think it work better instead of plate. Please let me know, thanks. I can’t wait to try it! Hi Adelaide, I just used a cake pan. No spring…although I agree a spring form pan would work great! I’m going to be blogging a nectarine version of this cake soon! Hi, Kathi. I have a question – how do you stop the strawberries from sinking to the bottom? They just kinda hover on top of the cake and don’t sink. The batter should be thick enough to hold it. Did you make it and did they sink? Curious…. hi this recipe looks delicious. I am planning to make but I don’t understand what the recipe means cut sides down? Ty for a lovely recipe! 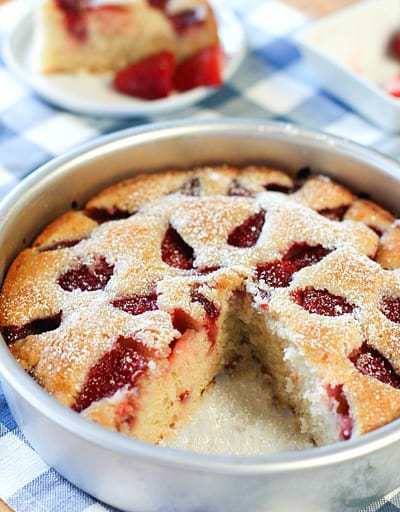 Hi Cathy – I mean the cut sides of the strawberries go into the cake so the nice rounded side is on top. Cut sides of the strawberries faced down. Sorry its so confusing…I’ll reword it! Hi Cathy- Not sure about the frozen strawberries…I think they would get really mushy. If you do use them – let me know if it works!… but I probably wouldn’t recommend it. 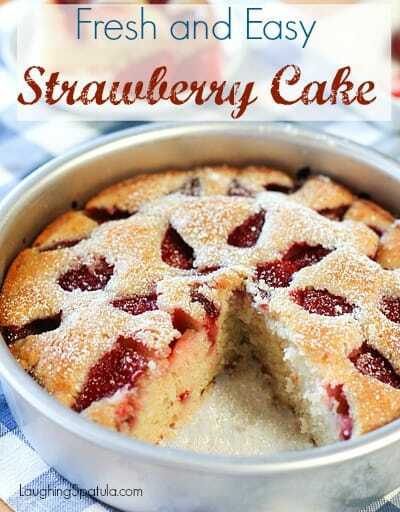 This strawberry cake is just so pretty! Lovely! This reminds me of classic French cake I’ve made for years that calls for nectarines and blueberries. What a wonderful way to say goodbye to summer! Martha probably lifted it from the Frenchies – old sticky finger Martha! HA! I think nectarines sounds wonderful in it! I just made this again to bring to a friend at the last minute. It’s a keeper!